Legends surround Sri Kalahasti, the temple town near South India’s most popular pilgrimage centre, Tirupati. Home to the ancient Shiva temple, the Sri Kalahasteeswara Temple, this town has been the centre of many legends, stories and folk lore. But it isn’t as widely known that this town in Andhra Pradesh’s Chittoor district also boasts of something that is in fact more renowned than the temple itself. Kalamkari. Literally meaning craftsmanship of the pen, Kalamkari refers to the hand painted cotton fabric that is counted amongst one of the most beautiful traditional Indian art forms. The Sri Kalahasteeswara Temple was originally built in the 5th century by the Pallavas under the shadow of a hill by the banks of the River Swarnamukhi. This was later extended by the Cholas in the 11th and 12th centuries. But it was in the 16th century, under Sri Krishnadeva Raya that it was most celebrated. And from then on, it hasn’t been just a mythical place of worship but the fountainhead for art and culture. Vilasini Natyam, which is the traditional temple dance form, also originated here. & what started out back then as a hand painted backdrop for the deities in the temple is what has today evolved to become one of the most appreciated fabric there is, purely for its artistic value. That there is the story of Kalamkari. But, there is more. For there is a variant, a different school of Kalamkari art that flourished under the Mughals and Qutb Shahis of Golconda. Here the fabric is block printed rather than hand painted and the motifs are more Persian than religious. This form of Kalamkari is produced in the town Machilipatnam, yet another town in Andhra Pradesh where flowing water is readily available. For whatever be the art form, it almost always draws inspiration from the society of the time, the geography of the land and availability of indigenous raw materials. And flowing water is an essential to the process of creating the Kalamkari textile. Before the actual process of art begins, the cotton fabric has to be prepped for drawing by washing it in water and soaking it in milk. A master artist then draws the design freehand in bold black strokes using a charcoal pencil. The cloth is then soaked once again, this time in boiling water before colours are filled in by the artisans using a bamboo kalam (pen). The colours are always natural and made from ingredients like indigo and myrobalan fruit. From sarees and dupattas to bed linen, this hand painted cotton fabric is considered hip and not just in the art circles. There is a huge demand for it today not just in India but internationally as well. Which is probably why now the Kalamkari motifs have grown to be so ubiquitous that you see them everywhere from bags to utility trays even. Getting There: Less than an hours drive from Tirupati, this trip can be a detour on your journey there. One can also drive down from Chennai, shop and get back, all in a day. hey! I am an architecture student doing a thesis on this place. can I know where exactly the Kalamkari employees are working. like a place near this temple or ? Hi Mirunalleni, it is not near the temple, you will have to go into the village. There is a cooperative, where the artisans comes to work. 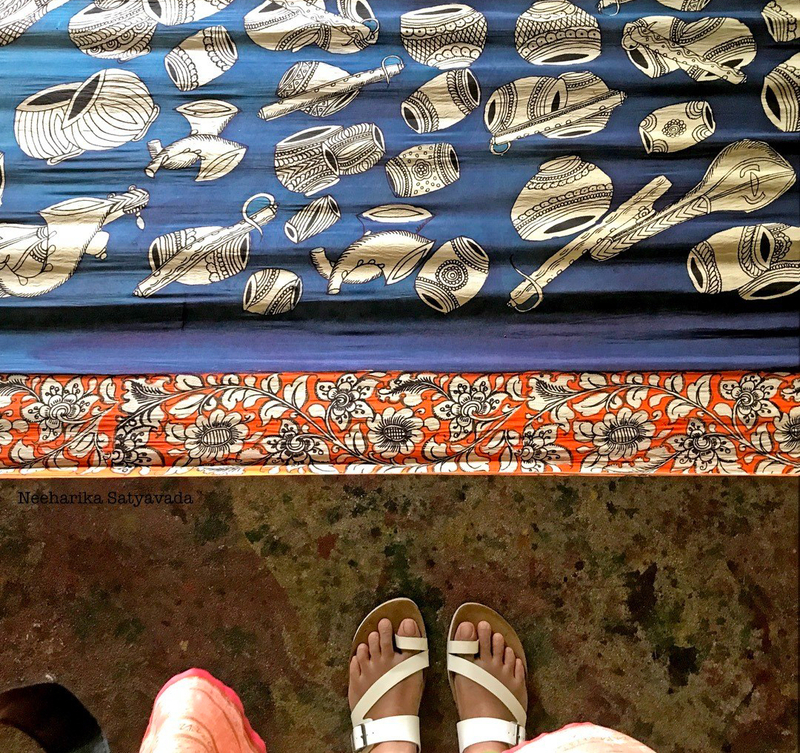 Wow….did’nt know how Kalamkari was done on fabric….beautiful!! I loved reading the Kalamkari story. You have captured the “artists at work” so beautifully too. brilliant photos!